Featuring blog posts about amazing homes, real estate trends & why we love Seattle. Rain or shine, this Mediterranean jewel brings its own sunshine to Seattle. With not one but two beautiful homes, impeccable grounds, all the comforts of modern luxury, and top-notch views, this lovely estate has it all. With everything it has to offer, it's easy to miss the best parts of this Mediterranean oasis. Here are our 10 favorite things about this gem. 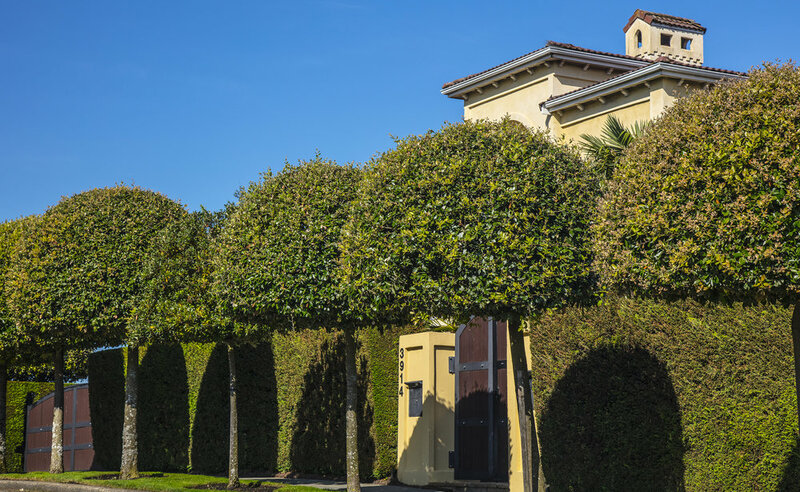 Beautifully trimmed hedges and sculpted trees line the street, and two large wooden gates offer the option for total privacy or a grand welcome for arriving guests. Lovely water features tie the estate together. Not only does it look peaceful, it sounds calming as well. There are countless spots to enjoy the grounds, especially in warmer months. The entrance to the main house features gorgeous double doors and hand painted murals. The high ceilings and warm tones offer an exquisite welcome, while the elevated main floor maximizes views. This art deco inspired home theater has you covered. From Super Bowl Sunday to family movie night, it provides all your entertaining needs. 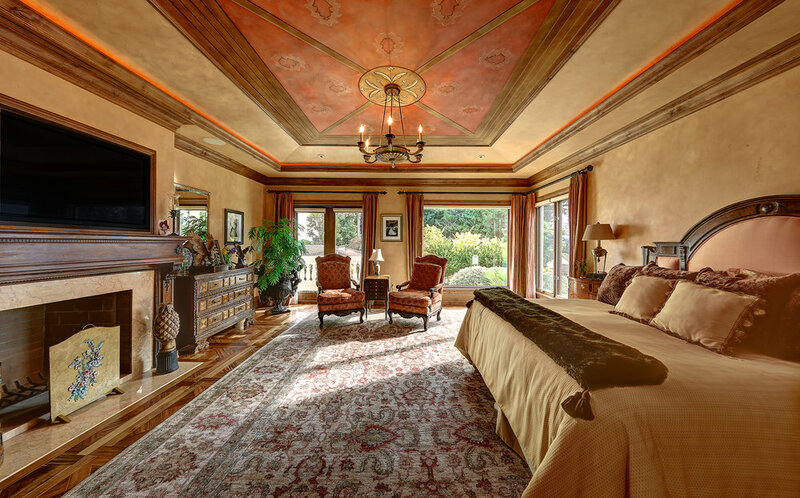 The list of amenities doesn't end there -- the main house features a billiard's room, library, wine cellar, full bar, garage space for 5 cars, and an elevator. During Seattle winter, this estate's warm Mediterranean vibes will get you through the chilly days. If you need a boost, just fire up one of fireplaces -- take your pick, there are 8! Beautiful French doors open to this space, which serves as a fantastic entertaining pavilion complete with pool & spa, outdoor fireplace, pool house, and a spacious patio. Great for summer BBQs or winter bonfires & hot tubbing. This estate is filled with perfect spots to appreciate Seattle's beauty. The main house common living area is located on the third floor to maximize views. Get a closer look from one of the balconies -- there is a lot to take in between Mt. Rainier, the Olympics, Puget Sound, and downtown Seattle. That's right... we haven't explored a foot of this lovely second home. Whether for family or guests, this additional dwelling gives everyone the privacy they need. From the lovely two-level living room to the rooftop deck, this house adds its own unique charm to the property. In addition to its endless views, we love this neighborhood for its fantastic farmer's market, plentiful shops & eateries, easy access to one of Seattle's best spots -- Discovery Park, and for feeling secluded (it is a peninsula after all!) while still having so much to offer. This 1.09 acre Bainbridge Island waterfront property was custom built with salvaged pieces from notable Seattle landmarks. 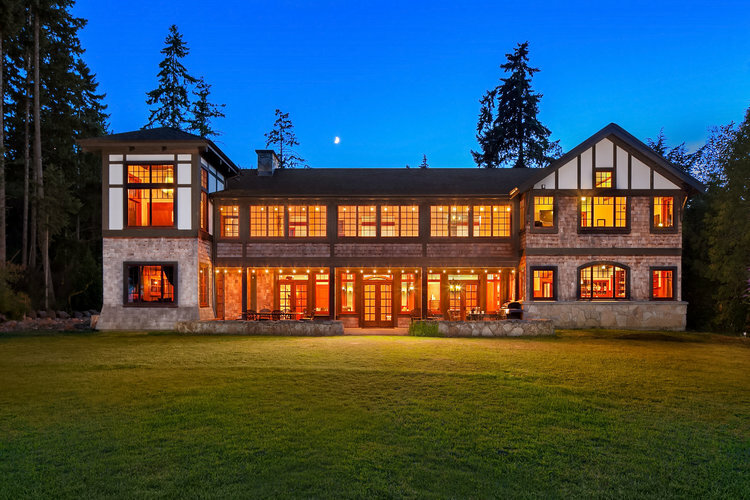 In the wake of the 2001 Nisqually earthquake, numerous Seattle landmarks were renovated or rebuilt and several artifacts and high quality materials were hand-picked, collected, and incorporated into this Bainbridge Island lodge over a period of thirteen years (2003-2016). The house was built around accommodating these items and displaying them to their full potential. Learn about where these historical gems came from and how they were repurposed. 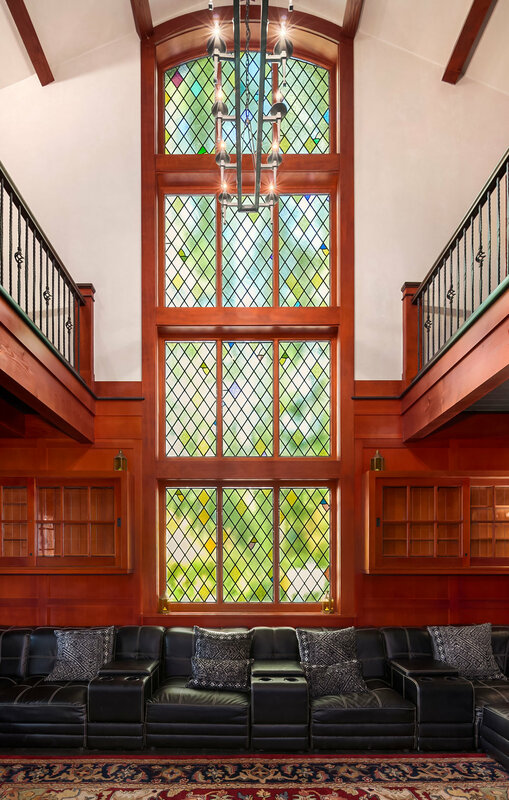 The home was inspired by British Columbia Tudor style homes, and opens to 5-inch thick solid oak front doors, once home to Seattle’s First Christian Church on Broadway, which was deemed too expensive to renovate following the damage it sustained in the 2001 earthquake. These doors were one of three sets of front doors that welcomed congregations for years. The house was designed to incorporate the stained glass windows, and as a result features impressive 30-foot cathedral ceilings. Several other stained glass windows also salvaged from the church are used throughout the house. This grand two-story great room features floors made of the highest quality old growth fir floors that are ~100 years old. The 20 foot long, 12 inch wide, 1 inch thick straight grain, clear fir slabs were once used as bleachers from several different schools that underwent remodels in the early 2000s: Garfield, Roosevelt, Cleveland, and Stadium High School in Tacoma all had their highest quality boards hand-picked by the builder. You might recognize Stadium HS as the filming location for 10 Things I Hate About You. The sliding glass cabinets on either side of the fireplace, in the media room and in the kitchen were salvaged from the Roosevelt High School chemistry lab, which completed renovation in 2006. Each cabinet features glass doors, that roll on copper rails, to replace hinges - to ensure forever durability. Once used to hold chemicals, they now function as display cases. The 36" doors throughout are made of solid Philippine mahogany and once belonged to the historic Camlin Hotel in downtown Seattle. The now 91-year-old Camlin Hotel was built in the 1920s and hosted numerous notables, including Frank Sinatra, Elvis Presley, Miles Davis, and Dizzy Gillespie. This home also features three porcelain and cast iron clawfoot bathtubs that also originally belonged to the Camlin Hotel. This tub in the master bath also features 100-year-old Pewter and hand blown glass chandelier, with Povie stained glass, which overlooks the harbor pond. The spacious kitchen has a beamed ceiling and counters made of carrara marble. These cabinets were made from solid growth fir salvaged from Seattle high school renovations. The slate floors featured in the kitchen and hallways were recycled from old chalkboards once used at renovated Seattle Schools. They were cut into 4’x4’ squares and flipped to form the floor of the kitchen and hallways. This beautiful dining area features one of the vintage wrought iron chandeliers, coupled with another in the billiard's room. While not historically significant, this intricate piece came all the way from Argentina and is ~150 years old. While not pictured, the billiards room features the tabernacle from Seattle First Christian Church, the ornate box that previously held the Eucharist. The harbor is a historic landmark and protected area that was once home to the busiest lumber mill in the world that supplied the timber to rebuild San Francisco after the great fire there in 1906. While this house is filled with pieces of history, it’s not so much about the pieces themselves, but the quality, uniqueness, and character that they bring. Together, they form a welcoming yet and grand environment -- a lovely waterfront retreat across the water from Seattle. In addition to a beautifully custom crafted home, this 3 bed, 3.5 bath property also boasts a 130 foot low bank waterfront with Blakely Harbor views, a shelf-lined library, an office (that can be converted to a fourth bedroom), a two-car garage, expansive front and back lawns, and unobstructed harbor and Seattle Skyline views. Houses come in all shapes, sizes, locations -- different views, different amenities, and different experiences. With so many variables, it can be hard to compare them. However, four of our listings are being offered at the exact same price. See what 5.95M gets you in Seattle. This grand Mediterranean estate, custom built in 2002, features two villas with unmatched city, mountain, and water views. Exquisite Versailles-esque courtyards and tranquil fountains are nestled between the two houses, while a turquoise pool/spa with full outdoor kitchen and fireplace offers a central gathering place for warmer months. 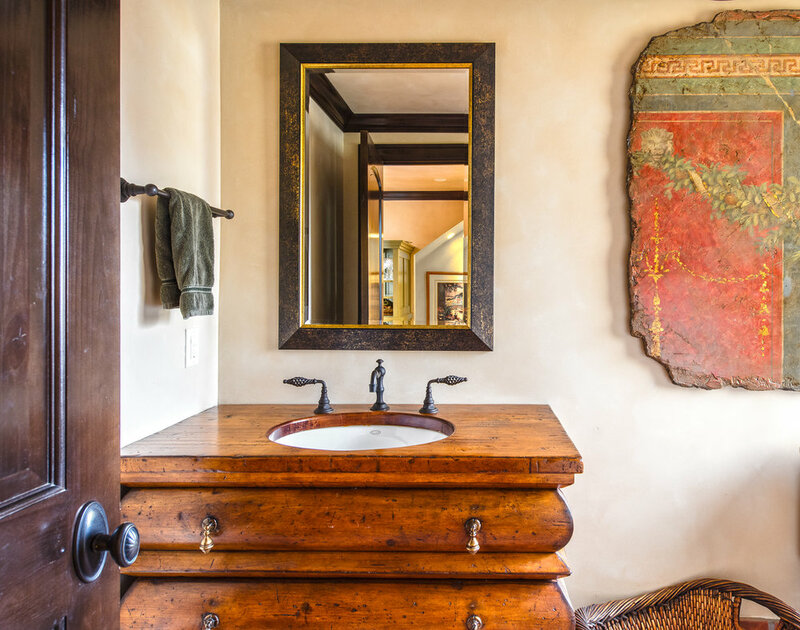 The interiors have high ceilings, hand-painted murals, top-notch stone/wood surfaces and antique accents. This stunning Rhoady Lee penthouse is located in the Art Stable, an award-winning 2010 building designed by Tom Kundig. The building features glass, steel and concrete architecture with 5 adaptable use residential units. Unit 700 consists of two levels with 11-ft. ceilings, Venetian plaster walls, concrete floors and walls of view windows. The top story offers living and dining areas in addition to a chef’s kitchen. A dramatic steel and glass staircase connects the two floors. Currently on the market, we have an eceptionally rare waterfront opportunity to own on the glittering Washington Park Gold Coast that comes complete with plans to build an original Stuart Silk custom home. Permits have already been submitted for new construction, and contractors' estimate to build in-hand. Outstanding value in the land alone! This stunning, custom-built Northwest contemporary home is also located in Magnolia. Designed by award-winning architects SKB, it offers unobstructed Puget Sound and Olympic Mountain views. Soaring ceilings and walls of glass capture stellar sweeping views from every room. Regardless of whether you're a native Seattleite or freshly transplanted, the transition from rainy season to warm, dry season means a big shift in how we enjoy our city. We take every opportunity to be outside, choosing outdoor patios, visiting local parks (especially ones with big views! ), we gobble up local produce, and attend barbecues with reckless abandon. What if you could enjoy all of these activities without ever leaving your home? Behold, the Skinner Mansion. This stunning, 10,000-sq.-ft. house is positioned on the crest of Capitol Hill, providing phenomenal views from the highest point overlooking the city and Elliott Bay. Click through the gallery below to learn more about all this incredible home has to offer. 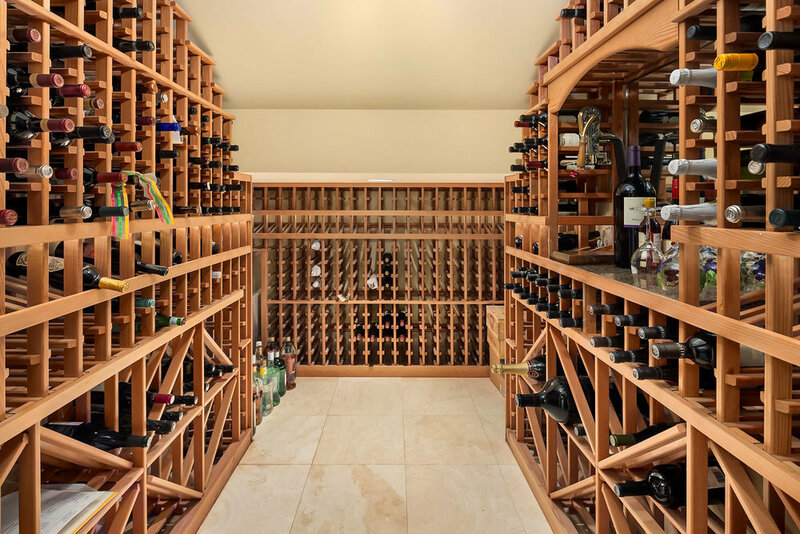 Select from your collection of 4,000 bottles in this custom wine cellar, and toast to the season of sunshine! Impromptu picnics with said wine—need we say more? Formal boxwood gardens burst into color, adding a fairytale quality to the entry of this stately home. The peaceful water feature provides tranquility at the entrance of this stately three-story home. 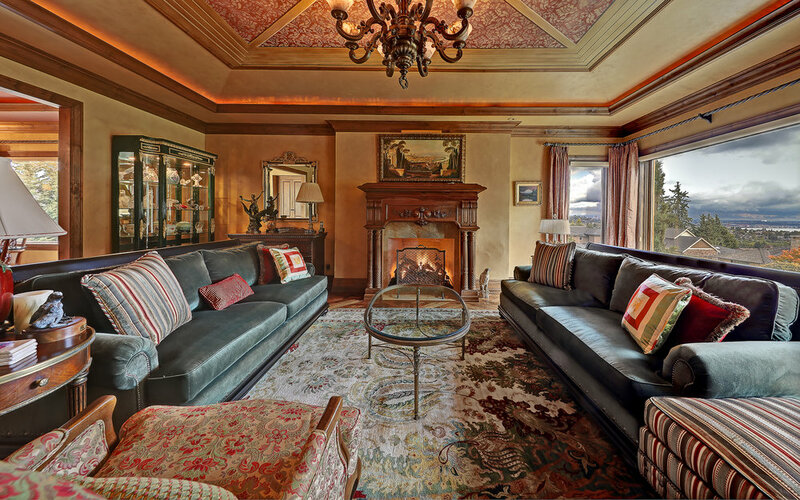 This spectacular media/billiards room with a built-in Dolby sound system has the feel of an English gentlemen’s club. Custom cabinetry conceals a 70ꞌ screen. Bar with a long granite-topped counter is equipped with an icemaker, refrigerator and keg on tap. Love gardening? Enjoy preparing foods harvested from your own garden! The raised bed in the rear of this home is ready for your fruits and veggies of choice. The kitchen enjoys lovely western vistas, while top-notch appliances include a paneled Sub-Zero refrigerator and a stainless steel 6-burner gas range with griddle and two ovens, warming drawer and dishwasher – all by Viking. Breakfast on the view terrace? A weekend ritual, waiting to happen! Enjoy the sumptuous views from this expansive terrace—accessible through the master suite. Again, the view terrace is quite large and will become one of your favorite spots in this home. The beauty of a west-facing view comes with endless sunsets. Volunteer Park, just blocks away! If all that wasn't good enough, Volunteer Park is located just a few blocks away. Capitol Hill -- a foodie's dream! The 15th Avenue shopping core is just a short walk from this home, with a bounty of wonderful shops and cafes. Truly, this home has it all. We told you! This home really is the dreamiest spot to spend Seattle summer—and every season! A spectacular setting in the heart of the city. Select from your collection of 4,000 bottles in this custom wine cellar, and toast to the season of sunshine! Impromptu picnics with said wine— need we say more? Love gardening? Enjoy preparing foods harvested from your own garden! The raised bed in the rear of this home is ready for your fruits and veggies of choice. A weekend ritual, waiting to happen! Enjoy the sumptuous views from this expansive terrace -- accessible through the master suite. Again, the view terrace is quite large and will become one of your favorite spots in this home. The beauty of a west-facing view comes with endless sunsets. Want to learn more? Visit SkinnerMansion.com for more! Or visit our Contact Us page if you'd like to tour this home. There's nothing like lighting some candles, queuing up favorite tunes, and sinking into a relaxing bath. Once you close your eyes, the whole world melts away (at least for a few minutes!). In honor of Mother's Day this weekend, we're sharing some of our favorite master baths from our current listings. These baths are perfect for pampering mom. This Washington Park view home features a master bath with marble tile floors, double sinks in marble-topped serpentine vanity, freestanding tub and frameless glass wall shower with marble mosaic tile floor. With its stylish Stuart Silk updates, this Queen Anne home has a spa-like master bath with radiant heated floors, honed marble Calacatta double vanity and dressing table, freestanding egg-shaped tub under Murano glass chandelier, big shower with opaque glass walls and bench, water closet with bidet. This Mercer Island contemporary features a spa-like, large scale bath with freestanding tub, glass-walled shower with built-in bench, two long vanities – one with a dressing table, and two water closets – one with a bidet. A floor-to-ceiling window gives the room lots of natural light. Adjacent to the bath is a big walk-in closet with skylights and special storage features. This beautifully updated Capitol Hill Colonial features a master bath with Carrara marble floors, glazed tile walls, a platform tub, separate glass wall shower, two marble-topped vanities and a heated towel rack. What does your dream bath look like? Share some love with us in the comments below! To learn more about our current listings, click here. With Valentine's Day just around the corner, we thought we'd pull together some of the most dazzling spaces in our current listings. Nothing says romance like cozy, well-designed spaces and big views. Scroll through these five luxurious photos and find the corresponding description below. With a wall of art in shimmering gold frames and a rich, tufted headboard, this room draws us in with its symmetry and playful textures. Light a few candles, and this Capitol Hill penthouse couldn't be more romantic. 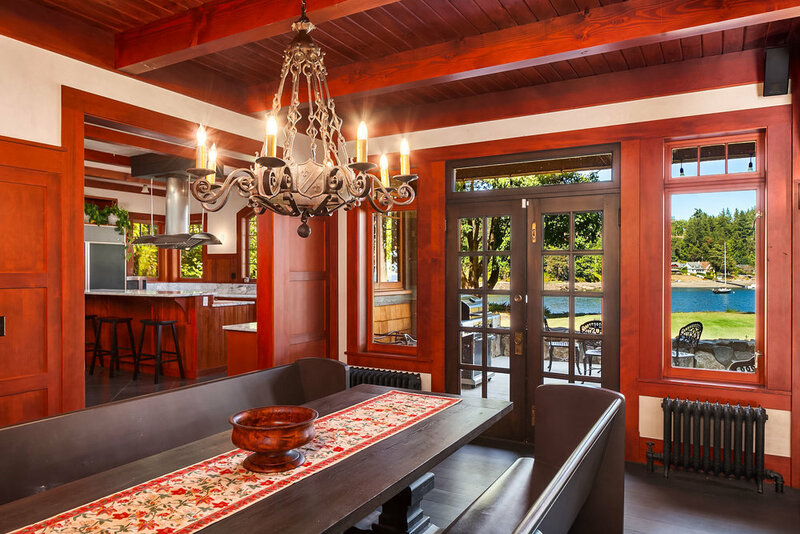 Recently remodeled by Stuart Silk, this gorgeous Queen Anne home has been redesigned to maximize light. In addition to the amble light throughout, mirrors have been placed strategically to enhance the bright essence of this gorgeous bath. Enjoy dinner for two, with front row seats to the Puget Sound's spectacular sunsets over the Olympic Mountains. Featuring different levels of outdoor entertaining spaces, this Magnolia beauty is sure to inspire every day. Nothing says romance like curling up next to a toasty fire! Long, luxurious velvet drapes create a stand-out statement next to the crisp white bedding. The gold-framed mirror is the final touch of glamour in this beautiful master suite in the Highlands. Imagine walking out onto your master suite terrace to find these sparkling city views! The scene transforms at sunset, when the sky turns the city into a sea of pastel hues. Grab a glass of bubbles, and watch the city glitter. Looking for more? See all of our current listings here. Kitchens are often the gathering place of a home, regardless of how much or how little cooking actually happens! And a well-designed kitchen can inspire us to eat in, have friends and family over, enjoy a long weekend breakfast. We collected a few of our favorite kitchens from our current listings, kitchens that we wouldn't mind brushing up on those cooking skills in -- because we all have goals of cooking more at home, right? This stylish kitchen stands out with its oversized island, eye-catching white quartz counters, and rich cabinetry. An open layout was applied to the whole main floor of this 1913 Georgian home in Queen Anne. Wonderful for entertaining, the kitchen flows right into the dining room, which flows naturally to the lush outside area. You can just see yourself hosting boozy brunches and intimate dinner parties, right? These counters look familiar, eh? We're seeing this style of crisp, white quartz counters often lately. They add a splash of sophistication and modern appeal. We love how the stark white counters are paired with the natural wood grain of the bar stools. With the sink situated in the island, the chef can also enjoy sumptuous views of Juanita Bay through the curved wall of windows that lines the main floor. With a large skylight overhead, you'll always have the benefit of natural light in this kitchen. The custom design that flows throughout this home is especially evident in this well-equipped kitchen. Pretty cabinetry does a lot of work here, showcasing dishware and providing a home for your most prized bottles of wine. If you think this is a great view, just wait until you see the Puget Sound views this home was built around. October was soggy, and November is settling into its usual crisp temperatures, so we're naturally spending a lot more time indoors. Winter months in Seattle are for cozy dinners, catching up on our favorite tv shows, testing out our rain gear, and getting inspiration for what we now have time to do, since we aren't busy basking in Seattle summer sunshine. Instagram just so happens to be perfect for gaining inspiration. Whether you're looking to live vicariously, get design/style ideas, or you just want some cheerful photos to distract from the doldrums outside, Instagram is full of talented bloggers with impeccably curated feeds. What's more, Seattle has oodles of its own such bloggers. We've selected four Seattle-based bloggers whose Instagram feeds are making us happy right now—each for very different reasons! Also featured recently, Cranberry Brie Mini Tarts. YUM! Total cook time? 13 minutes! Whether we plan to make Meghan's recipes or not, we love when these shots pop up in our Instagram feed! With over 16,000 followers, Joanna Hawley has definitely made a name for herself in the Seattle blogging scene, and beyond! Jojotastic is a 4-year-old lifestyle blog that focuses on "runway-fresh fashion, inspiring modern-but-modest home interiors, and [Joanne's] addiction to donuts." Filled with a delightful mashup of lifestyle goodies, her Jojotastic Instagram feed is always bright and always inspiring. With cozy lifestyle shots, DIY tutorials, and adorable shots of her furbabies, we always enjoy seeing what Joanna is up to! Minimalism is so in right now. And understandably so! There is so much clutter in our lives (just look at our physical mailboxes and our digital inboxes). Minimal design and fashion styling attempts to soothe us with simplicity. It's like a visual breath of fresh air. Jejunemargo's minimal feed is endlessly chic. She weaves texture, pattern and style into her restrained color palette. If you're ever craving some less-is-more inspiration, her feed is your go-to. Colorful, slice-of-life photographs fill MeSeatellite's Instagram feed. Pretty food photos (ahem, Mamnoon! ), cozy cafes, and all sorts of other locals-only Seattle features inspire us to get out and keep exploring our wonderful city. MeSeatellite's feed is almost like a love letter to Seattle, documenting its many facets, personality traits, and stunning nature scenes. And if you're looking for a stylish real estate Instagram feed, don't forget to follow us! Wallpaper has had its share of transformations over the years (starting a couple thousand years ago with decorated rice paper in the homes of stylish Chinese, followed by Europeans in the 16th century.) While paint has become the new staple in home decor, wallpaper is coming back into vogue. With a wide array of designs to choose from, wallpaper can transform an entire space, infusing it with elegance, whimsy and style. The following photos—hand selected from our listings this year—show just how versatile and delightful wallpaper can be in a well-designed space. From entryways to bathrooms, the right wall covering can be transformative in the best possible way. Bathrooms can be the perfect place to experiment with wallpaper. We love this black-and-white color palette paired with a classic French toile de jouy. The distinctive, hand-painted wallpaper in the foyer of this custom Roland Terry home completely elevates the space, making the doors disappear. With its stunning chandelier, this entryway dazzles with Scalamandré wallpaper. Juxtaposed against the bright, airy (and mostly wallpaper-free) decor in the rest of this updated Broadmoor Colonial, the elegance of this pattern really shines. The gorgeous silk-lined walls of this dining room take on a life of their own with luscious drapery to match. A light-filled dining room, these rich colors and stunning sheen provide intimacy and style. Enter the foyer of this Highlands home to find an arched ceiling, curved walls and this whimsical wallpaper. In perfect contrast to the arches, this style feels as if you've just entered a castle somewhere in Europe. Like what you see? Explore these homes: Chic powder palette | A pop of pattern | Breathtaking elegance | Larger than life | Step back in time. To see more beautiful Seattle real estate listings, click here. Brandon Bright, Seattle Office Manager for Avenue Properties, is our guest blogger this week. We asked Brandon to give us a foodie tour through his favorite Seattle neighborhood -- Columbia City. 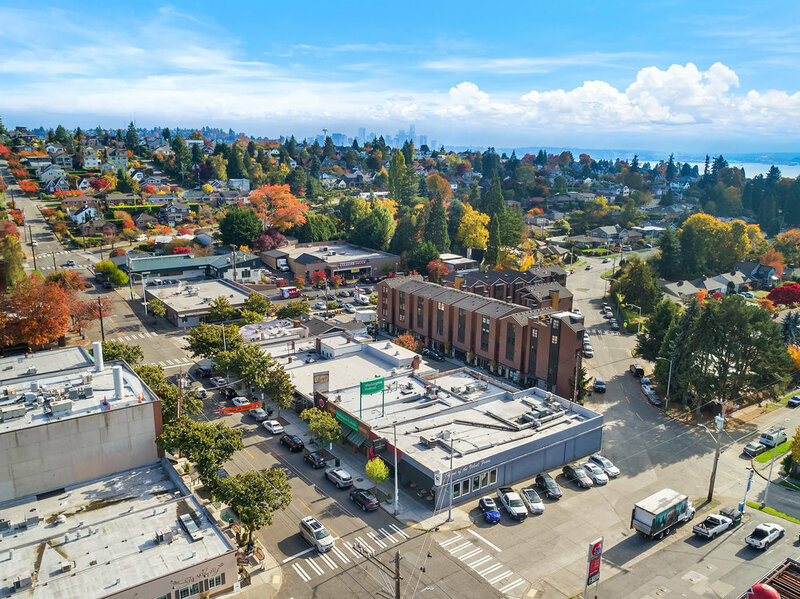 The Columbia City Historic District was added to the National Register of Historic Places in 1980, and has become a recent Seattle hot spot with desirable neighborhoods, breathtaking valley views, and convenient light rail access. With various incredible bars, shops and eateries, Columbia City continues to grow and flourish while maintaining its friendly neighborhood vibe. Last year, Seattle Met named Columbia City one of Seattle's 10 Best Neighborhoods. Three of my favorite spots in particular make this neighborhood both a great place to visit, and a great place to live. When you think of soul food, Seattle doesn’t usually come to mind. One visit to Island Soul Restaurant will upend that perception. With roots straight from Jamaica, following the tradition of authentic Jerk and soul food, you are sure to find something on the menu that tickles your taste buds. Be sure to get there early on the weekends – their famous brunch always draws a packed house! Restaurant, bar, project room, place of all-things-awesome. The Royal Room is a Columbia City staple and well known for its array of live music, dance parties and special occasions. With a different event scheduled every day of the month, there is always something fun and new to do in Columbia City; especially at The Royal Room. This week, we attended Inman's Luxury Connect conference in Beverly Hills to learn about real estate marketing, technology, business intelligence -- and to catch up with the most talented realtors in our industry. We were overjoyed to soak up some California sunshine, learn new insights, and to also reaffirm what we already know and practice. Read about our main takeaways from this year's conference. 1. If you market to everyone, you market to no one. Sharran Srivatsaa, co-president of Teles Properties gave a powerful talk about 7 Superpowers of Elite Agents. His first slide announced "Riches are in the niches" -- meaning that finding your specialty is imperative to your success. Once you can find that focus and connect with your audience, you'll be off to the races. This advice is applicable to most industries, but particularly helpful for real estate since there is such an immense spectrum to our business. 2. Get to know people and show your value. Building upon this sentiment, Director of the Compass Global Sports & Entertainment Division, Kofi Nartey explained that once you have identified your niche, you must know your value and exude it with confidence. Many other speakers touched on this point as well, including Sally Forster Jones, President of John Aaroe International Luxury Properties, who emphasized how realtors must lead with the tremendous value they provide to their clients. 3. When it comes to branding, consistent online presence is key. We heard this over and over at this year's Luxury Connect. Realtors often have to be a one-man (or woman!) show, from salesperson to legal expert to marketing guru. Taking the time to plan out how you want your brand to be perceived is crucial. From your social media presence, to your website, everything should be current, flow seamlessly and, (this is big) be mobile-friendly. We learned from Adam Fish, Partner Lead responsible for the Real Estate business at Google, that 50% of people will use a competitor's site if your site is not mobile-friendly. And 40% of people will abandon a site if it takes longer than 3 seconds to load. Wonder how your site stacks up? Use this link to find out how fast your website loads, and use this link to determine whether your website is mobile-friendly. Many of the homes on Capitol Hill’s ‘Millionaire’s Row’ fascinate us. What makes this grouping stand out among the historic homes in Seattle is that these grand early 20th century residences are largely intact — renovated, updated, restored — giving us a unique glimpse into the past. And if one home in particular stands out for its restoration, it’s 725 14th Avenue East. Originally built between 1903 and 1905, the house is best known as ‘The Skinner Mansion,’ named for the prominent shipping magnate who lived in it from 1914 until the 1950’s. The 10,000-sq.-ft. house sits on a half-acre lot — one of the largest properties on Capitol Hill. The estate was carved up into three separate lots in the 1970’s. In 1999, the current owners acquired the properties that had been sold and restored the estate to its original footprint. This aerial shot shows the grand size of this estate. The 10,416-sq.ft. home is a sight to behold, with gorgeous front grounds, spacious side yard, and charming back pathway to vegetable garden. Georgian characteristics include a roof with a center gable, cornice with dentil detailing, and cedar-shingled walls with quoins. An entry terrace and formal boxwood gardens provide a lovely approach to the stately three-story home. This sunroom has original harlequin-patterned marble tile floors and custom full-wall sliding windows open to give the room a true open air feel while in floor heat ensures comfort year-round. 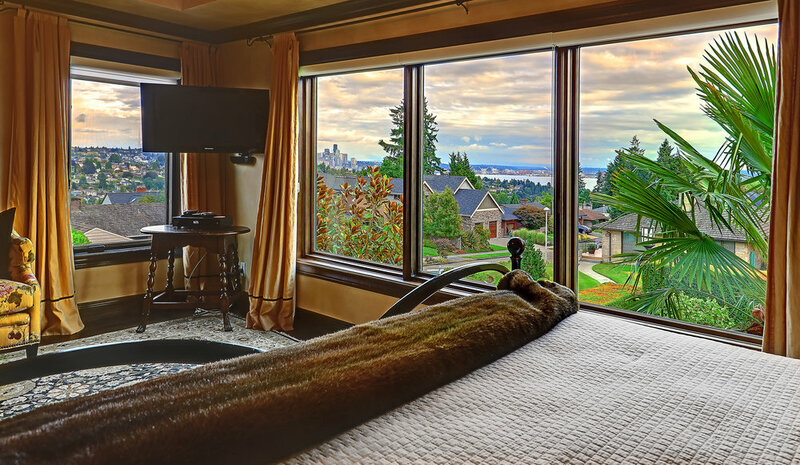 Master bedroom has access to a full-width deck with stunning city, water and mountain views. The master bath, appointed in white Venentino marble has a soaking tub with western views, glass-wall steam shower, vanity with double sinks and water closet. Cherry millwork and marble floors replicate the entry design. Downstairs, a spectacular media/billiards room with built-in Dolby sound system has the feel of an English gentlemen's club -- including custom bar and keg on tap. A wine cellar with a custom glass door and slate floors has a wood racking system for more than 4,000 bottles. Magnificent city, water, and mountain views can be seen from various rooms throughout this home. Interested in a tour? Contact us for your own private showing. To see more wonderful Seattle real estate, visit our full list of homes. During those blustery winter months in Seattle, we make do by donning cozy sweaters, drinking warm mugs of tea or coffee, and dreaming of the sunny, dry days of summer when we just can’t get enough of the great outdoors. Seattle summers are more than great, they are exceptional. In the spirit of summer outdoor living, we hand-selected some of our favorite outdoors spaces on the real estate market right now. There is a major zen factor to this backyard. With expansive golf course views, this 1929 Colonial is situated next to the Broadmoor Golf Club’s 14th hole. A multi-use sport court and secluded hot tub are located just off the huge patio — perfect for enjoying a variety of outdoor activities leading from daytime barbecues to a relaxing nighttime soak. 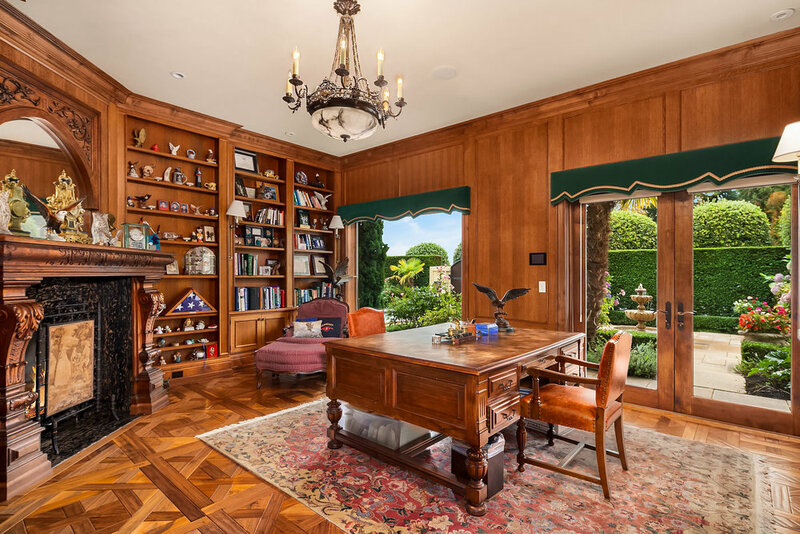 This 1937 view estate exudes charm from the inside out. Beautifully landscaped terrace off the house’s main level overlooks a turquoise lap pool and expansive sloping lawn, bordered by rose bushes that lead to a lower level lawn with a vine-draped arbor, raised beds and a fruit orchard. With such a lush, inspiring setting, you’ll want to make outside dinner parties a summertime ritual. The grounds of this historic Capitol Hill estate have so much to offer. From formal boxwood gardens at the entry, to a full vegetable garden out back — there are so many experiences to be had! Pictured above, levels of bluestone terraces invite outdoor living and entertaining, and the expansive side lawn is ideal for baseball, croquet and badminton. Gorgeous water feature, plus a tree-house tucked just beyond the lawn! If we go missing, you just might find us here. This gorgeous Bainbridge Island home has it all: ample lawn with meticulously manicured gardens, path to a private beach with 200 feet of waterfront and mooring buoy, and forested front grounds that teem with life. Endless Puget Sound views throughout the grounds and the house up the dazzle factor. Front row seat for the Independence Day fireworks? Check! This fabulous Capitol Hill penthouse is perfectly situated to take in views of Lake Union, the Olympics, and the Seattle skyline. These views fill the living spaces, and the huge roof deck is ideal for relaxation, entertaining and sky-watching. Just imagine sipping champagne from the rooftop hot tub during the firework show grand finale.